I love this interview of Vance Nelson, director of Creation Truth Ministries, posted on Creation Declares. It addresses some common evolutionary myths and should challenge the way we think about history and our origins. Here’s a brief overview and some key points. As an avid dinosaur buff, I find it breathtaking to observe dinosaur footprints in rock and to see their fossils being carefully removed and preserved. I’ve had a chance to watch scientists working on these fossils in museums, and I’ve enjoyed observing some of these formations myself at Dinosaur National Monument in Utah and Dinosaur Ridge, Colorado. Just imagine what it would have been like to see many of these odd creatures roaming the earth- sort of like watching a real life Jurassic Park. Unfortunately, according to evolutionary history, dinosaurs died out 65 million years ago, so no human has ever seen a living dinosaur. Supposedly they went extinct when a large meteor hit the earth long before man ever evolved. It wasn’t until 1822 that we have confirmation of the first dinosaur fossils discovered, and in 1841 Sir Richard Owen coined the term “Dinosauria,” which means “terrible lizard”. Fortunately, however, that’s not the only explanation of what happened to the dinosaurs. When it comes to the creation/ evolution debate, there’s overwhelming evidence suggesting that dinosaurs were still living until fairly recently. Nelson, who holds a Bachelor’s of Science in Biology, has written several books, one of them showcasing ancient artwork of dinosaurs drawn by natives long before modern science knew what dinosaurs were. On one of his most recent trips, Nelson journeyed to the Amazon to study one of these ancient Indian pictographs in Northern Peru. He and his team of scientists traveled about 13 hours to the remote site. 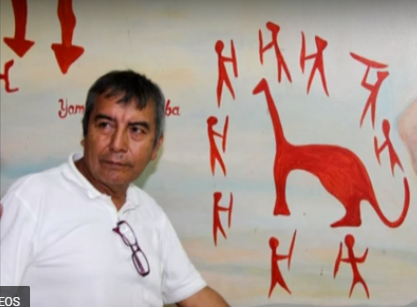 What they found was unbelievable… drawn with red pigment was a large creature that looked exactly like a long-necked sauropod dinosaur surrounded by nine hunters with spears, one with his spear raised, ready to pierce the terrible beast. According to one of the team members, Professor Ulysses (Director of the Regional Museum in Peru), there are about ten archaeologists aware of the pictographs, and they have all affirmed the drawing’s authenticity. None of them deny that these were the original drawings, and they’re left “stunned”. Archaeologists Dr. Nunez and Dr. Alva took samples and sent them off for dating by plasma oxidation and carbon 14 analysis. The results indicate that the artwork is at least 3,200 years old- far older than the discovery of any known dinosaur fossil. So, what does all this mean? Well, let’s put it in perspective. Those skeptics convinced that dinosaurs died out 65 million years ago aren’t going to change their minds so easily. Some have, predictably, resorted to mocking the discovery, as if that’s helpful. Others claim it was some other kind of living animal, like a llama or crocodile. And still others are forced to admit that some dinosaurs may have escaped extinction in this particular valley until humans arrived. As a Biblical creationist, however, discoveries like this are confirmation of a young earth and substantiate the Genesis creation account. Evidence like this is welcomed and predicted. The Bible tells us that God made birds and sea creatures on Day Five of creation, and all the land animals and man on Day Six. Therefore, man and dinosaurs lived together until fairly recently. Dinosaurs probably died off sometime after the flood as a result of numerous factors, including an inability to adapt to changing climates and encroachment by man, who saw them as a threat and killed them off. Addressing the criticism a little closer, when we examine the pictographs, we can plainly see a dinosaur, not a crocodile or llama. There’s no living animal that this reasonably resembles. Llamas have long necks, but short tails. Crocodiles don’t have long necks, nor do they have pillar-like legs. Skeptics desperately want to avoid the obvious likeness to a dinosaur because it contradicts the evolutionary history they’ve concocted, and it would come as an admission that secular science got this wrong; such and admission would undermine evolution and increase support of creation. After all, if secular science got this wrong, then what else have they gotten wrong? Now take a close look at the pictograph and notice the tail. See how it’s curled up and raised off the ground? All the earliest dinosaur books and skeletons assembled in museums incorrectly had the tails of dinosaurs dragging behind them on the ground. I still have a book published in 1985 with the dinosaur tails drawn dragging behind them. It wasn’t until later in the 1980’s that scientists began to elevate the tails off the ground. But it seems ancient man got the anatomy correct right from the beginning. Why? Because they had observed a living dinosaur (while the scientists had not). We can also rule out the theory that only dinosaurs in this valley escaped extinction because there’s numerous artwork all over the world with various kinds of dinosaurs drawn from ancient history. In addition, there are many written accounts of man encountering these terrible creatures; even the Bible describes the Behemoth and Leviathan as we would a dinosaur or marine reptile. The bottom line is that drawings like this are further evidence that man and dinosaurs lived together, and that we can trust God’s word over man-made ideas like evolution and naturalism. Hello I will admit right away I am a sceptic. Please allow for a peaceful discussion here, I simply wish to learn more about this subject. As a sceptic I would like to know how the idea of a singular god is not man-made. The original biblical texts were written less than 4000 years before our current time, but humans are known to have lived for at least 6000 years, even if you believe the earth was created that recently. So there are at least 2000 years of humans who did not believe in a singular god, instead having no religious deity or a religious deity for many things in life. Thanks for the comments. I’d be happy to have a peaceful and thoughtful discussion, especially with an amateur paleontologist such as yourself. That’s a field of great interest to me as well. And thanks for being honest that you’re a sceptic. Your questions are complex, but I’ll attempt to be brief. You ask, “how the idea of a singular god is not man-made”. Great question. Firstly, I’m a Bible believing Christian, and a young earth creationist. I believe there are many man-made gods, so I can understand a certain level of skepticism. If you’re asking a sincere question (and I believe you are), then let me ask you to accept this premise for a moment: accept the premise that the God of the Bible does exist. If he does exist, then not only did he create the universe, earth and all that is in it, but he also has revealed himself through his word, which is compiled in the Bible. If God exists, we’d expect him to reveal himself in some way and for some reason, and I think we have good reason to believe that’s exactly what we have in the Bible. Okay, you may then ask, why should we believe what the Bible says over any other religious writings? Well, I believe the Bible has maintained the consistency necessary to substantiate its claims. The Bible provides a credible and reliable history. If there were legitimate contradictions or false teachings, they would have been exposed long ago. Now, of course, there are skeptics who claim there are contradictions, but I would gladly challenge them. Further, I would maintain that science affirms the Bible’s claims. Those who wrote the Bible are diverse and reliable, and we know much of it can be supported by archaeological evidence. There are also prophecies and miracles that affirm Scripture, many supported by outside sources. I think it’s evident that these people believed in the God they wrote about because they were willing to face death for their beliefs, and many did so because they believed God’s promises and knew there was something better awaiting them- and that’s a righteousness that only comes from Christ. Now I would disagree with the idea that there’s at least 2,000 years of human history with no God or god(s). Again, if we accept the Bible’s premise, then God created the first human- Adam- who worshiped God. Therefore, Adam and his descendants worshiped the same God Christians worship today. It is reasonable, however, that some of his children and grandchildren would have rebelled against God and chose not to worship him the same way this happens with children today; not all children of Christian parents will accept their parent’s faith. Many will rebel, and when they do that, they often follow other gods, or choose a god-substitute. There is so much more I could write, but I’ll stop there for now because I’d love to hear more from you. But that would only be assuming there is no God/god(s) and the Bible was merely written by fallible human beings. If that were the case, then I’d agree with you. However, as you know, Christians believe the Bible is the inspired word of God (2 Timothy 3:16), which means that the Bible is accurate and infallible due to God’s revelation. So we can rely on the Bible’s history, and when we do so, we see that science compliments Scripture. The Bible is affirmed (or vice versa) by archaeology, biology, geology, etc. And this discovery of ancient man with a dinosaur is further evidence to substantiate this. True, we do need more than a few pieces of sketchy evidence, and we do. This isn’t the only ancient drawing with man and dinosaurs coexisting, and I’ve gone into detail about many of the other evidences, so I think it’s fair to say that the evidence overwhelmingly supports the Bible. Sure, other Christians may not think the way I do, and you know very well that not all atheists think the way you do either. But I do think I’ve studied these subjects at greater length than most of those who may disagree with me, and I have a better understanding of the material at hand and can support my claims with solid evidence. This was a fairly brief seach for ‘authenticity of pictographs / carvings showing humans and dinosaurs together’. I’m sure an actual archeologist could pick these apart even more easily, but thats not me…. Again, this is just a smattering of examples shared for comparison if anyone wants to do the reading. I dont planning on checking back here much, nor am I going to be arguing on and on about this…just wanted to provide the counterpoint. I realize they dont all really address this specific claim – wasn’t able to find a whole bunch on that. more images that look like aliens or outright nonsense. Its almost as if the creators of the images didn’t feel constrained to draw what they saw, but were using their imagination and creativity to make art, much like people do today.